“The Mayor has announced backward steps on his own Phase 5 of the low emission zone (LEZ5) which was only agreed two years ago. “The Mayor blames the poor performance of diesel vehicles for the delay even though he has known about it for years and other, cheaper, technical solutions are available e.g. the fitting of selective catalytic reduction equipment (SCRT) which can reduce emissions of oxides of nitrogen by up to 88% and emissions of particles (PM10) by up to 77% (using the Mayor’s own estimates for buses). “Worse, today’s announcement amounts to a wish list for others e.g. a repackaging of existing monies that local authorities can apply for and an Ultra Low Emission Zone for the next Mayor to consider. “London has the highest concentrations of nitrogen dioxide (NO2), a toxic gas, of any capital city in Europe and up to 9% of all deaths are attributable to long-term exposure to dangerous airborne particles (PM2.5). Air pollution is the biggest public health risk after smoking with levels twice or three times legal limits near our busiest roads. “The Mayor cites cost savings to business from his backward steps on LEZ5 but is silent about the huge costs of air pollution to the public, the health service and business from some of the worst air pollution in Europe. “The Mayor also claims reductions in tail pipe ‘emissions’ of PM10 and NOx of 15% and 20% respectively. But he has refused an Environmental Information Request from Clean Air in London to substantiate these claims which would anyway be based on computer modelling assumptions. What matters for health and legal compliance are ‘concentrations’, which is the air we breathe, and the latest analysis by Clean Air in London shows the worst sites hardly changing in the last five years and in some cases worsening. 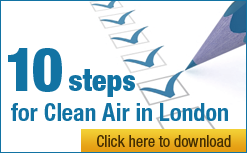 “London needs: one or more Ultra Low Emission Zones by 2015; decisive action to eliminate carcinogenic diesel exhaust; and press releases from the Mayor to warn of smog episodes and reduce additional hospital admissions. London is today suffering the second serious smog episode this year. “London should be leading the world in tackling air pollution not lobbying to weaken international air pollution laws and delaying action to reduce the most harmful pollutants. The Mayor gave a Key note speech at an event titled ‘The Mayor’s Air Quality Fund’ at City Hall on Wednesday 13 February.